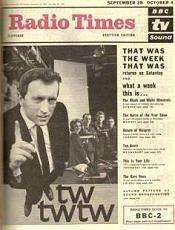 The programme is considered a significant element of the satire boom in the UK in the early 1960s. It broke ground in comedy through lampooning the establishment and political figures. Its broadcast coincided with coverage of the politically charged Profumo affair and John Profumo, the politician at the centre of the affair, became a target for derision. TW3 was first broadcast on Saturday, 24 November 1962. Cast members included cartoonist Timothy Birdsall, political commentator Bernard Levin, and actors Lance Percival, who sang topical calypsos, many improvised to suggestions from the audience, Kenneth Cope, Roy Kinnear, Willie Rushton, Al Mancini, Robert Lang, David Kernan and Millicent Martin. The last two were also singers and the programme opened with a song – That Was The Week That Was – sung by Martin to Ron Grainer's theme tune and enumerating topics in the news. Frankie Howerd also guested with stand-up comedy. Script-writers included John Albery, John Antrobus, John Betjeman, John Bird, Graham Chapman, John Cleese, Peter Cook, Roald Dahl, Richard Ingrams, Lyndon Irving, Gerald Kaufman, Frank Muir, David Nobbs, Denis Norden, Bill Oddie, Dennis Potter, Eric Sykes, Kenneth Tynan, and Keith Waterhouse. The programme opened with a song ("That was the week that was, It's over, let it go ...") sung by Millicent Martin, referring to news of the week just gone. Lance Percival sang a topical calypso each week. Satirical targets, such as Prime Minister Harold Macmillan and Home Secretary Henry Brooke were lampooned in sketches, debates and monologues. Other targets were the monarchy, Britain's declining status as a global power, racism (particularly in the American South and South Africa under Apartheid), sexual and social hypocrisy, the class system, and the BBC itself. Well-remembered sketches include a 'consumers' guide to religion', which discussed relative merits of faiths in the manner of a Which? magazine report. On Saturday, 20 October 1962 the award of Nobel prizes to John Kendrew and Max Perutz, and to Francis Crick, James D. Watson, and Maurice Wilkins was satirised in a short sketch with the prizes referred to as the Alfred Nobel Peace Pools; in this sketch Watson was called "Little J.D. Watson" and "Who'd have thought he'd ever get the Nobel Prize? Makes you think, doesn't it". The germ of the joke was that Watson was only 25 when he helped discover DNA; much younger than the others. TW3 was broadcast on Saturday night and attracted an audience of 12 million. It often under- or overran as cast and crew worked through material as they saw fit. At the beginning of the second season in the autumn of 1963, in an attempt to assert control over the programme, the BBC scheduled repeats of The Third Man television series after the end of TW3. Frost suggested a means of sabotaging this tactic to Sherrin, and he agreed. For three weeks, Frost read out the plot of The Third Man, until the repeats were abandoned following the direct intervention of the BBCs Director General Hugh Greene. After two successful series in 1962 and 1963, the programme did not return in 1964. The reason given by the BBC was that 1964 was election year and political material could compromise the corporation's impartiality. Prime Minister Harold Macmillan was initially supportive, chastising the Postmaster General Reginald Bevins for threatening to "do something about it". However, the BBC received many complaints from organisations and establishment figures. Lord Aldington, vice-chairman of the Conservative Party, wrote to the BBC's director-general Hugh Carleton Greene that Frost had a "hatred" of the Prime Minister, which "he finds impossible to control". The programme also attracted complaints from the Boy Scout Association, upset by an item questioning the sexuality of its founder Lord Baden-Powell, and the government of Cyprus, which claimed a joke about Archbishop Makarios, the country's ruler, was a "gross violation of internationally accepted ethics". Its subject matter has also been praised. McCann says: "TW3...did its research, thought its arguments through and seemed unafraid of anything or anyone.... Every hypocrisy was highlighted and each contradiction was held up for sardonic inspection. No target was deemed out of bounds: royalty was reviewed by republicans; rival religions were subjected to no-nonsense 'consumer reports'; pompous priests were symbolically defrocked; corrupt businessmen, closet bigots and chronic plagiarists were exposed; and topical ideologies were treated to swingeing critiques." An American version was on NBC, initially as a pilot episode on 10 November 1963, then as a series from 10 January 1964 to May 1965. The pilot featured Henry Fonda and Henry Morgan, guests Mike Nichols and Elaine May, and supporting performers including Gene Hackman. The recurring cast included Frost, Morgan, Buck Henry and Alan Alda, with Nancy Ames singing the opening song; regular contributors included Gloria Steinem, William F. Brown, Tom Lehrer and Calvin Trillin. The announcer was Jerry Damon. Also a guest was Woody Allen, performing stand-up comedy; the guest star on the final broadcast was Steve Allen. A running gag was a mock feud with Jack Paar, whose own programme followed TW3 on the NBC Friday schedule; Paar repeatedly referred to TW3 as "Henry Morgan's Amateur Hour." On April 21, 1985 in the United States, the ABC network aired "That Was The Week That Was" as a special, hosted by David Frost (also serving as an executive producer) and Anne Bancroft, and featuring future Saturday Night Live cast members Jan Hooks and A. Whitney Brown and puppetry from Spitting Image. ↑ Stuart Jeffries, "This'll kill you", The Guardian, 16 January 1999, p. B5. ↑ "A British Program Honoring Kennedy Shown Over NBC". The New York Times. 25 November 1963. p. 10. ↑ "BBC marks TW3 anniversary". BBC News. 26 November 2002. ↑ Hastings, Chris (17 June 2007). "Tories helped take TW3 off the air". The Daily Telegraph. 1 2 McCann, Graham (2006). Spike & Co. London: Hodder & Stoughton. pp. 313–314. ISBN 0-340-89809-7. ↑ "TV Trends: Conspicuous Cameras". Image Dissectors. 2010-06-08. Retrieved 2013-09-01. ↑ "• View topic - The Last Sundown for Cinesation: 2013 Fest Report". Nitrateville.com. Retrieved 2014-05-31. ↑ "Lost and Found Sound: The Stories". Npr.org. Retrieved 2014-05-31. ↑ Nijland, Yfke. "'Zo is het toevallig ook nog 's een keer'" (in Dutch). Geschiedenis 24. Retrieved 22 August 2013. 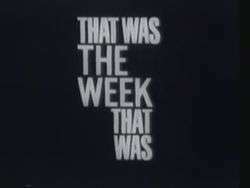 ↑ "'THAT WAS THE WEEK THAT WAS (TV)'". Retrieved 5 November 2015. ↑ Watson, Elena M. (2000). Television Horror Movie Hosts: 68 Vampires, Mad Scientists and Other Denizens of the Late Night Airwaves Examined and Interviewed. Jefferson, North Carolina, United States: McFarland & Company. ISBN 0-7864-0940-1. Retrieved 2014-05-31.